When a state changes hands and you have been put in charge your first major decision will be whether or not sell the home that is part of that estate. That will require the advice of a real estate broker and lawyer to make sure this is the best way for. You also want to determine where the proceeds of that sale will be disbursed as it pertains to the wishes of the estate. While all of that is being sorted out, you will be best served by taking care of the estate cleanup. This can be a big job if you were to do it by yourself. Thanks to Junk King Orlando, your estate cleanup just got a whole lot easier. This is the team you want to help with this project. An estate clean up means to literally clear every room in the home. That process can actually start with the help of an estate sale. The more pieces you can move out and get paid for the better off you’ll be. What is left behind is essentially all the things nobody would want. Even though they might be useful they certainly don’t need to be kept in the home. All of those items can be collected by the Junk King crew in a very efficient manner. The team can start at the top floor and bring everything down and onto the truck in no time at all. The typical junk removal session set up a Junk King will always be staffed by lease to capable movers. This is the team that can easily handle taking up an old sofa or refrigerator. An estate cleanup might require some extra help. The only reason for that is to make sure everything can be cleared out in a single session. Yes, those two movers could do all the work but you don’t want to tie up your day for several hours. The more help the Junk King can send over the quicker things can go. Junk King will send over that extra help without any extra charge. You’ll still paid a flat rate based on how the truck it’s packed up whether it takes two guys or six. If you need an estate cleanup taken care of, then you need to put Junk King Orlando on job. Give them a call today. 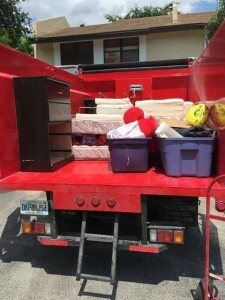 This entry was posted in Orlando Junk Removal and tagged estate cleanup, junk king, junk removal on March 31, 2019 by Junk King. Last updated March 31, 2019 . Getting rid of furniture is never easy. Unless it is a dining room chair it will usually take at least two people to move a piece of furniture like a sofa, table or desk. It also will require a truck big enough to hold that piece of furniture. Put it out on the curb or in an alley is not an option. This is especially true if you are getting rid of office furniture. You certainly don’t want any potential customer to see rubbish outside your place of business. The easy solution for office furniture removal is to turn that job over the Junk King Orlando. A typical junk removal session set up by Junk King will be staffed by two strong movers. This is the team that can make quick work out of removing any piece of office furniture or equipment. Yes, Junk King can also take away your outdated copiers, printers, monitors, fax machines and computers. Just getting rid of one of each of those is going to open up a lot of room in your business. The Junk King crews will also work swiftly. They know how important it is not to disrupt the business. Of course, you can also schedule Junk King to handle the office furniture removal on the weekend or when the office is closed. All you have to do is show them what you want removed and it will be gone in less time than it takes you to read the morning emails! Junking Ross to provide responsible disposal of all the things that you are getting removed from your office. If the office furniture is still usable, then it can be donated to a charity. As for all the equipment, that can be dropped off at it e-waste recycling center. This is the kind of environmentally friendly disposal policy that Junk King has been operating with since they began collecting junk back in 2005. As part of the Orlando community, Junk King wants to ensure that future generations will have clean-air and clean water. The task of taking care of office furniture removal and the equipment disposal will be easy when you hire Junk King Orlando to get it done. This entry was posted in Orlando Junk Removal and tagged junk king, junk removal, office furniture removal on March 26, 2019 by Junk King. Last updated March 26, 2019 . This is the time of year when homeowners are planning out their big spring cleaning projects. It usually means an entire day of dusting, mopping, vacuuming and decluttering throughout every room in the home. Of course, the home is in the only place where this type of cleanup should occur. You can take inspiration at this time of year to also conduct a big office cleanup. Along with all the same dusting and vacuuming you might determine that there are several big items that need to be removed from the office. That’s when it is time to hire Junk King Orlando. These professional junk haulers can clear out your office of any unwanted item in no time at all. There are some offices that are visited by clients all the time. In other companies, clients may never set foot into the office but that doesn’t mean it should still be cluttered with rubbish. Your staff will appreciate coming to work every day in the environment that isn’t overwhelmed by outdated office equipment and broken furniture. All of that can be cleared away by the Junk King team. Junk King will dispatch a pair of capable movers. This is a crew that has been licensed and insured. They’ve also been fully vetted and trained to handle any kind of furniture or equipment removal. That matters when you are in an office space and need to share a freight elevator with other tenants. You can schedule your appointment with junk King to either coincide with your workday or on the weekend when the office is closed. The junk King crew will need a lot of supervision. All you have to do is tell them which specific items you want removed and the pick him up right from the spot. Before you know it, your office will be cleaned like never before! As for the cost, Junk King charges a flat rate which is always appreciated businesses. That rate will cover all the transportation, labor and disposal. You’ll know what this causes before the work begins because it will be provided in a written estimate. Once agreed-upon, that estimate will change. There won’t be any hidden charges. When you’re ready to take on your big office cleanup, Junk King Orlando will be ready to help make it happen. This entry was posted in Orlando Junk Removal and tagged junk king, junk removal, office cleanup on February 28, 2019 by Junk King. Last updated March 2, 2019 . One of the most popular times to visit Disney World is around the holidays. Although spring break isn’t considered an official government holiday it is one of the times are years when families pack up and hit the road. Since you live in Orlando, it is safe to assume that anyone you know who lives out of the state might want to come visit you during spring break. If you are opening up your home for out of town guests, then you want to get things ready by clearing out the rubbish. Junk King Orlando can help with that task. Whether you want to make room in the garage for another car or have the ability to pull out the sofa bed sleeper in the guestroom, Junk King can help clear the way. We keep a lot of things in storage that are used throughout the year. This is true of things like holiday decorations or summer sporting equipment. However, they could be just as many things you’re keeping in storage that you never intend to use again. It could be something that you or your kids have outgrown. It might be something that has been broken but instead of getting repaired it’s just collecting dust. They could also be a lot of things that you have upgraded around the house like televisions or computer monitors. That is quite an eclectic collection of items that is taking up valuable storage space. That only becomes a problem when you need to use that space or things are cluttering up your guestroom. One call to Junk King can make it all disappear. The team from Junk King is going to do all the work for you. They don’t want to see you lifting anything. Even if you think it will make things easier for them you still shouldn’t lift something. Suppose your back goes out? You won’t be able to have any time with your spring break guests. Just leave everything right where it is and when the Junk King crew shows up you can point out the items that you want removed. In no time at all those things will be gone. Getting your home clear of rubbish for spring break visitors doesn’t have to be complicated. Just give the job to Junk King Orlando and you can consider it done! This entry was posted in Orlando Junk Removal and tagged junk king, junk removal, spring break cleanup on February 25, 2019 by Junk King. Last updated February 25, 2019 . There is a simple equation that many professional home organizers utilize: anytime you bring something new into the house, two things need to go out of the house. That works great with clothing in the closet. Obviously, it will be easy to find two shirts or two pairs of pants that you can get rid of after buying a new outfit. But what if you were to apply that same rule to the bigger things. Suppose you bring in a new recliner? That means you need to take out at least a futon. Replacing a TV means the old TV has to go it can’t be tucked into another room or out into the garage. Keeping your home free of that rubbish is not as complicated as it might seem provided you have the help from a company like Junk King Orlando. These are professional junk haulers who have been helping Orlando homeowners, apartment renters and businesses clear out tons of rubbish. That is literally and figuratively! Most of what people hire Junk King to get rid of our things that can’t be stuff into a trashcan. However, once they’ve decided to get rid of the big pieces a lot of little things get added onto the truck as well. It really is a terrific opportunity having two movers and a big truck at your disposal for this type of work. You might want to just devote all of your energy to clearing out the clutter in your garage. Or you could have enough of a stockpile of old electronics to warrant a session with Junk King. Junk King’s disposal policy is also something you want to factor into your decision. They strive to make sure that anything collected gets a chance at being recycled or repurposed. That’s very important with e-waste. But your old furniture, clothing and other household goods can be put to use again by a family need when those items are dropped off at a charity. Junk King knows exactly where to take all the stuff it collects and most often that’s not a landfill! Making your Orlando home free of rubbish is easy with help from Junk King Orlando. They are ready to make it happen today. This entry was posted in Orlando Junk Removal and tagged junk king, junk removal, rubbish on January 31, 2019 by Junk King. Last updated February 1, 2019 . Property managers have to make two sets of people happy at the same time. They need to make the owners of the property that they are managing happy by taking care of all the day-to-day operations. They also have to make the tenants who are occupying those properties happy so that they will continue to pay rent and not cause any major upheavals. Of course, the very nature of rental properties means that tenants aren’t going to be staying forever. When a tenant does move out, property managers have to spring into action to fill up that space as quickly as possible. That starts the cycle of making the “two sides” happy all over again. To help facilitate that transition Junk King Orlando can provide vital help with regard to rubbish removal. That might be all that the standing in the way of renting a property. That’s what makes this type of service so important for property managers. The vast majority of tenants want to get their security deposits back. That means a final walk-through to ensure that the space they are leaving behind is in the exact same state it was when they first moved in. Unfortunately, there are a handful of tenants who write off their security deposit in exchange for rushing out of the space and leaving a lot of rubbish behind. Ironically, if they were to hire Junk King to get rid of that rubbish, then they would be saving money and still get their security deposit back! One call to Junk King sets up an appointment to get any property clear of rubbish. It doesn’t matter if it’s an apartment on the top floor of a building or a townhome. All property managers have to do is coordinate the appointment with the Junk King team so that they can show them all the things that have to be removed. Once the crew has a chance to look over those items, they’ll be able to provide a final estimate for the service. That estimate will be based upon volume and not weight. That will certainly make the owners happy! When the fee is finalized, the crew will get to work and in no time at all that living space will be clear of rubbish and ready to be rented out again. Property managers can always count on Junk King Orlando for quick rubbish removal. Put them to work today. This entry was posted in Orlando Junk Removal and tagged junk king, junk removal, property managers on January 26, 2019 by Junk King. Last updated January 26, 2019 . What Are Junk King Orlando Customers Saying About The Service? Yes, Junk King is going to do all the work for you. What may be a challenge for you to move won’t be a struggle for the Junk King team. That’s what you’re hiring them for! Junk King knows how busy your day is. They want to make sure you can maximize every hour and that means they work fast. That’s a great way to sum up a junk removal session with Junk King: friendly and professional. When you need reliable junk hauling the only call to make is to Junk King Orlando. The reviews aren’t wrong! This entry was posted in Orlando Junk Removal and tagged customers, junk king, junk removal, reviews on December 31, 2018 by Junk King. Last updated December 31, 2018 . A few days after New Year’s everyone wishes they had a little “Christmas magic.” More specifically the kind of magic that could make all the Christmas decorations be packed away without lifting a finger. Instead, you’ll have to dedicate as much time as it took to put everything up to taking it down. The last remaining item will be that empty Christmas tree. Do you have plans for that tree? What about plans for any of the junk that has accumulated around the house in the past year? You might be surprised to learn that both the Christmas tree and that junk can be made to “disappear” if you make the right call. That would be a call to Junk King Orlando. Junk King has its own type of “magic.” That is provided by two very capable movers. There are several teams working with junk King but each call is handled by at least two of those crew members. Every one of these Junk King workers are licensed and insured. They also come with a lot of experience with regard to lifting and loading heavy objects. 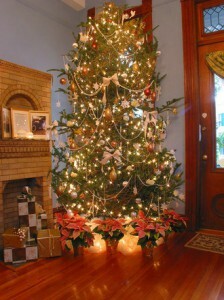 Your Christmas tree will certainly fall into that category! But so can an old futon, bedroom set, crib, entertainment center or washing machine. Those all kinds of things that junk King loads up on the truck every day. And you can have those items literally scattered throughout the house. The Junk King crew will swiftly pick them up from whatever room they are located in and clear them out the front door in no time at all. Speaking of time, Junk King doesn’t want to waste your time. They only asked that you set aside a two-hour window for the completion of their work. Unless there cleaning up something massive like a hoarder level type of situation, they can usually clear out a dozen or more pieces in under 20 minutes. That sounds downright magical! When your Christmas tree and junk is ready to be hauled away don’t hesitate to hire Junk King Orlando. They are ready to make it happen today! This entry was posted in Orlando Junk Removal and tagged Christmas tree, junk king, junk removal on December 26, 2018 by Junk King. Last updated December 26, 2018 . All across the country, folks are bringing out their holiday decorations to string up on the outside of the house and put up on the tree on the inside of the house. Usually, we hang up the same decorations each year. However, there is always an opportunity to add to the displays. You might even reach the point where you have so many decorations that they have to be put into rotation! Before you put up any of your decorations you want to make sure there isn’t a speck of rubbish anywhere inside or outside of your home. A session with Junk King Orlando can certainly help with the rubbish removal task. When the Junk King team arrives for your scheduled appointment, they can start the rubbish removal on the outside. This is a great chance to finally get rid of a lot of things that have been causing an eyesore in your yards. Whether it’s an old bird bath or grimy planters it could be loaded onto the back of the Junk King truck. That is also where you can put unwanted patio furniture, yard waste and any random construction materials. After all that rubbish and debris has been cleared away you can put up the holiday lights. Things look a lot brighter without that junk everywhere! After the yards been cleared up, the Junk King team can move to the inside of your home. That’s when you can show them the old futon you want to get cleared out. You could also have piles of clothing and electronics from the closet that can be gotten rid of. Those are the kinds of things that should be donated or recycle. 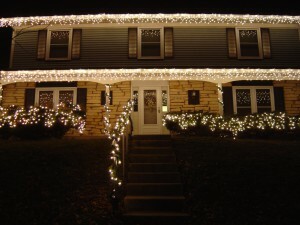 At this time of the year, it will be hard to devote several hours to accomplish that task. But it won’t be for Junk King. They make those kinds of drop-offs as part of their weekly routines. If you want to get your home ready for the holidays by removing the rubbish, then you want Junk King Orlando helping out. Put them to work today. This entry was posted in Orlando Junk Removal and tagged holidays, junk king, junk removal, rubbish on November 30, 2018 by Junk King. Last updated December 1, 2018 . How would you rate yourself as a “gift giver?” There are some folks who literally agonize over getting the perfect gift for the people in their lives. Others take the nonchalant approach, which often results in gift cards for everyone! Both scenarios are very much appreciated. Then there are those occasions when you can come up with a unique, one-of-a-kind gift idea that can actually last throughout the year. One such gift would be a junk removal session from Junk King Orlando. Do you know someone that could benefit from having all the junk and rubbish cleared from their home? Maybe it’s not just one person! A junk removal gift starts with determining what needs to be removed. You can tell the recipient of your gift that when Junk King is handling the removal pretty much anything and everything can go. The work is going to be handled by a two-man moving crew. This is the team that has been licensed and insured. And when it comes to lifting and loading heavy objects there is no match to the team from Junk King. No one should feel embarrassed about asking them to get rid of heavy stuff that is upstairs or a bulky item in a spare bedroom. They’ll be able to navigate down any type of hallway or flight of stairs. They also work fast. A typical junk removal session lasts for just about 30 minutes. That is not long at all when you consider the trade-off of all that reclaimed storage space. 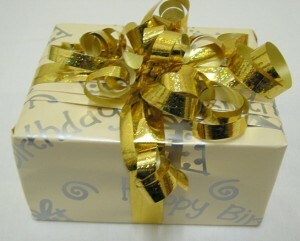 Once you coordinated with the gift recipient about what they want to get rid of you can lockdown the appointment time. Junk King can be very accommodating with their schedule whether you want to have a morning, afternoon or weekend take. All they ask is that you set aside a two-hour window that will allow them to get from one appointment to the next. Once the crew arrives at the location they look over all the items that I can be loaded onto the truck and determine the final price. You are going to like that fee as well. Make a junk removal session with Junk King Orlando the ultimate holiday gift you give this year. This entry was posted in Orlando Junk Removal and tagged gift, junk king, junk removal on November 24, 2018 by Junk King. Last updated November 24, 2018 .